It might be simple for you to write off the importance of having a nice grinder for dry herbs, but the right grinder makes all of the difference in the world. The Space Case Grinder is a heavy duty, high quality model with a number of features and an outstanding grind quality that make it a force to be reckoned with. Read on to see a full review of the Space Case herbal grinder. 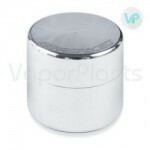 - Grind Quality - The grind quality of this herbal grinder is simply unmatched. It features sharp titanium teeth that let you grind up large amounts of herb quickly, while the remaining smooth, fine grinds rest in the large middle compartment in storage. There is nothing left over after you grind your herb which saves both money and time. - Guarantee - The Space Case Grinder comes with a lifetime warranty! - Prep Time - Prepping for a session takes no time at all with the Space Case Grinder. Simply open the magnetic top and pop in your herb, then grind away. The holes are large enough that material will not get caught, but small enough to keep out large pieces of herb or stems from getting through to the ground herb chamber making prep time quick. - Portability - This grinder features a magnetically sealed lid that allows you to travel with the grinder without worrying about dumping its contents by accident. - Ease of Use - The Space Case dry herb grinder is shaped like a cylinder and the lid is easy to screw off and on, letting you grind in a smooth twisting motion. The appliance is perfectly suited to fit in your hand while turning the lid, and Teflon O-rings make it even easier to use, especially for those with arthritis or injured hands. The Teflon also helps to ensure less friction and a finer grind. The metal is coated with a non-stick formula that makes cleaning a breeze and keeps clumps from forming inside. - Additional Features - The Space Case Grinder comes with a pollen mesh screen that collects crystals like no other. Beneath the pollen screen is an abundant "kief catcher" where you can collect and store pollen. It also comes with a kief scraper. - Quality and Size of Build - Made from solid titanium that is thin and lightweight, the grinder is sturdy, which you will be able to see from the moment you hold it in your hand and feel its smooth, anodized surface. Its teeth are also titanium and will never become dull, ensuring a grind that is fine every time. The Space Case is a top quality grinder that can easily last you for years to come. It is made from smooth titanium with an anodized surface to make it comfortable to hold in your hand. Teflon O-rings make for a comfortable grinding experience that produces finely ground material ready to go into your vaporizer for herb. This 4-piece grinder features a pollen screen for collecting crystals and a catch at the bottom for kief, making this one of the most efficient grinders you will ever own. This grinder is just cool, does exactly what it needs to do, grind and be discreet. I have been using it for half a year now, the metal teeth are still strong and sharp, this is my main grind. This is more of in the house grinder.